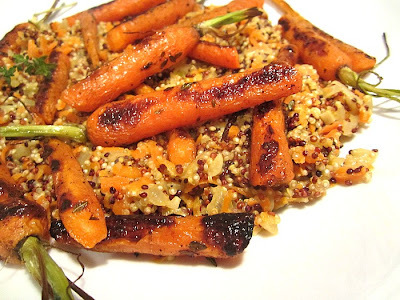 I was obsessed with this recipe and photo on Jewels of New York's website, and had it bookmarked waiting for my pretty colorful carrots to pop up in the garden. Well, I couldn't wait, so I went out and bought baby organic carrots, though I couldn't find the yellow and red ones. Oh well, orange carrots will have to do. Baby carrots are smaller and sweeter than regular carrots, and they come with their bright green leafy tops attached. You can save the leaves for soups if you like. This was rich like a risotto made with arborio rice, but uses our favorite healthy quinoa instead. I used Kerry Irish Gold salted butter by mistake, which I usually save for smearing on bread, not for cooking, and the dish came out rich and delicious, and needed no extra salt at all. I roasted my carrots w/ cumin and fresh thyme. I also cut down on the heavy cream from 4 tablespoons, to 2, and I wished I had doubled this recipe, because it was so damn good, we inhaled the entire thing. Cut the carrots lengthwise and diagonally (for large carrots) into 2 inch pieces. 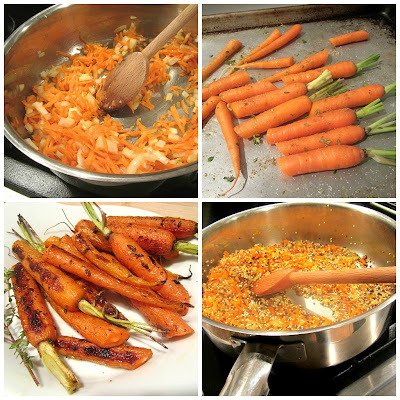 If using baby carrots, keep them whole and leave some of the green tops on for color. Spread on a baking sheet and drizzle with olive oil. Season with kosher salt and pepper, cumin and thyme. Roast vegetables in oven for 15-20 minutes, until browned at the edges (shake the pan after 10 minutes, so all sides get brown). In a large saucepan, melt the butter over medium heat with a little olive oil. Add the onions and carrots, sautéeing for 5-7 minutes, until they begin to caramelize. Add the garlic and cook until it softens, about 2 minutes. Add wine and reduce for a minute or two. Stir in the quinoa, combining well. Continue stirring, adding broth 1/2 a cup at a time until absorbed, about 20-25 minutes total. Keep stirring. You will do this in 4 steps, like making risotto! Once all the liquid has absorbed, turn off heat and stir in heavy cream and parmesan. Lay the roasted carrots on top of the risotto and serve immediately. My kind of dish. In the same camp as the bulgar wheat pilaf I made this weekend - with finely shredded savoy cabbage, hell's own amount of completely caramelized onions, a few pulverized tomatoes, and a handful of broken up spaghetti strands. 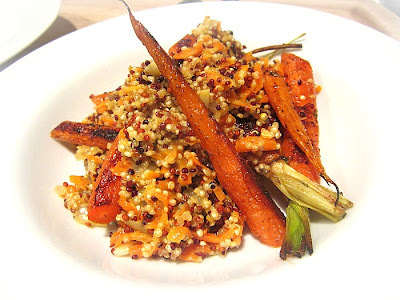 I love healthy grain and vegetable combos. I served mine with a dollop of a quick dill/garlic/yogurt raita. This meal sounds so completely decadent though I love that in actuality it's filled with a ton of health! Mmmm, this risotto looks delicious! I have never made my own risotto but I think I am going to try it! I could turn into a vegetarian from eating this one! 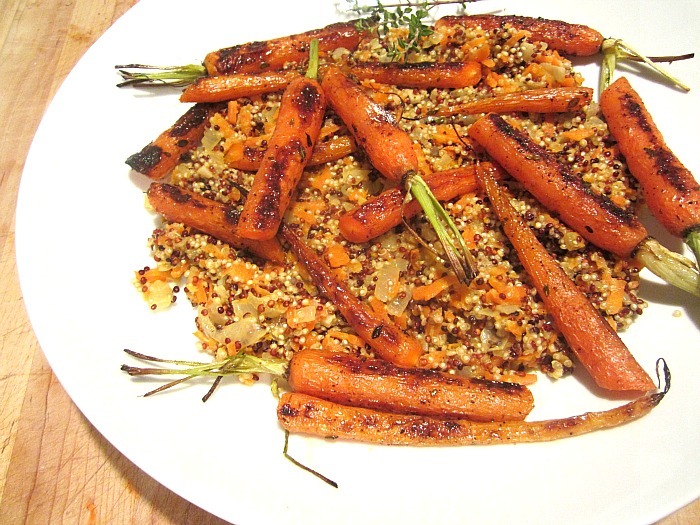 Looks delicious and I love roasted carrots. Will try it with quinoa. Sounds like the perfect dish for our anniversary dinner tonight. Thanks! I've got to try this quinoa stuff! For some reason I balk at it....seems too healthy, but next time I'm in town I'll pick some up. I notice you use it often and I always love what you cook. I had to come back and see this. Sounds fabulous!